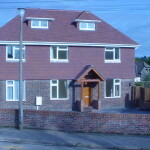 2014 marks the 10th anniversary of this 6 bedroom detached home in Borough Green, Kent. In late 2003 Friargreen were commissioned to undertake the design and build of a new 6 bedroom home on the plot of a run down 1920′s bungalow. Handling the design process and obtaining planning permission, right through to handing the keys to the client in 2004. Friargreen fulfilled the clients brief to deliver a good quality, low maintenance home designed for long term rental as part of their project portfolio. We’re pleased to see that the building continues to achieve this and still meets the home owners needs 10 years after the building project was handed over.